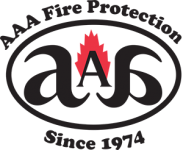 For affordable and high-quality fire extinguisher services call AAA Fire Protection Services at (800) 543-5556. We are experts in the field of fire extinguisher services and offer a complete line of fire extinguisher sales. In addition, our 40 plus years in business has helped countless Dublin businesses and businesses throughout the entire East Bay Area and the Tri-Valley area avoid citations from fire code enforcement agencies. We'd like to work with you to keep your business in compliance. Our fire extinguisher services include the annual fire extinguisher inspection, which is part of the requirements under the California Code of Regulations - Title 8, Section 6151. In addition, we verify when fire extinguishers need to be recharged and we help with that too. Every 5- to 12-years fire extinguishers need to undergo hydrostatic testing. We track that and we perform that service too. Our services are comprehensive. Our pricing is affordable. If you're ready to work with an expert fire protection team, then just give us a call at (800) 543-5556. We are happy to answer your questions, provide you with a quote or schedule a walk-through.